> 80% is very very good. Esp compared to linpack. 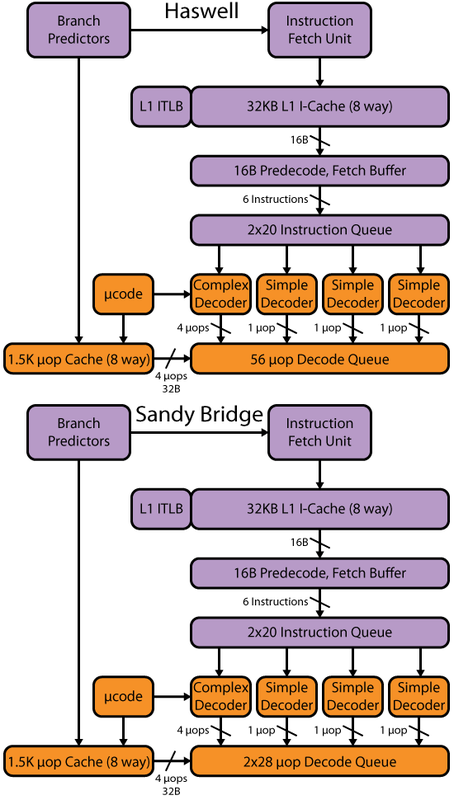 It does not have to be a cache of main memory; the stacked DRAM could be (part of) main memory itself. Why not? anon (anon.delete@this.anon.com) on July 29, 2012 11:09 am wrote: > aaron spink (aaronspink.delete@this.notearthlink.net) on July 29, 2012 5:39 am wrote: > > Emil Briggs (me.delete@this.nowherespam.com) on July 28, 2012 6:11 pm > > wrote: > > > > > There are two places where we are > > > using GPU's. One of them > > consists of large matrix operations and are done using > > > the Nvidia cublas > > library. Those run close to 80% of peak. The tricky part of > > > the work here > > is keeping the CPU's busy doing something useful while moving the > > > > > matrices back and forth to the GPU. The other place is some finite difference > > > > > routines. Still working on this. It's faster than doing it all on the > > CPU's but > > > not by much. I'm trying to get more overlap between the CPU and > > GPU's here but > > > this section of the code is not as suitable for that as > > the first. > > > > > > > 80% is very very good. Esp compared to linpack. > > > > > > > > > > Agreed. How difficult do you think it would be to implement > > > > > coherent memory access? > > > > > > > Depends. If you can convince PCI SIG to > > implement a coherent protocol the difficulty shouldn't be that high. Efficiency > > wouldn't be the greatest since the basic protocols for PCI-E are designed around > > large block transfers but it would be doable esp with the move to integrating > > PCI-E on die. > > > > Probably the easiest solution for something like MIC would be > > to integrate a QPI interface in addition to the PCI-E interface. At that point > > it primarily becomes an exercise in setting up the memory map reasonably/sanely. > > The MIC would need both a caching agent and a home coherency agent, but it > > should be possible to do some cut and paste. > > > > What would be more difficult in > > the QPI + PCI-E space is get maximum advantage out of it. You would ideally > > like to use both the QPI agent and the PCI-E agent for bulk DMA traffic while > > only using the QPI agent for coherent traffic. Using the QPI link for bulk DMA > > would likely take some work with the various DMA engines. For the MIC local > > coherent memory you would likely only make a subset of it available for coherent > > access from the CPU in order to simplify the performance requirements (likely a > > variable window size that is programmable) so that all memory accesses from the > > MIC to its local memory don't have to remote snoop though if you have the area > > available, you might be able to get away with an SRAM based directory (basically > > limited capacity coherency from the MIC to CPU aka evict to make space) as well. > > > > > > For the CPU memory, you would likely be unrestricted assuming that the CPU > > side used some form of directory. > > > > Total DMA bandwidth should be at least > > equal to 32x PCI-E. And for coherent access you are looking at a minimum of 16x > > PCI-E bandwidth. > > > > And from a practical standpoint you are going to want 2xQPI > > or QPI+PCI-E since it is unlikely that the market requirement will be there for > > the CPUs to have 3x 16x PCI-E. Though if your network interface chip runs over > > a single QPI link it might be viable, but I kinda see the ideal setup for a top > > end super as 1 QPI + 16x PCI-E to both the MIC/GPU and to the network interface. > > So you would be looking at ~32+GB/s (at current speeds, likely 64+ GB/s in the > > 2015 timeframe baed on PCI-E 4.0 announced goals) in and out of the CPU to both > > network and MIC for a total of 128 GB/s which means that memory bandwidth likely > > becomes you main bottleneck. > > > > Also lets not forget that by the time this > > happens we are likely going to see some form of stacked memory in reasonably > > wide use, which means that the CPUs will likely have 1-4 GB of ultra high > > bandwidth "cache". > > It does not have to be a cache of main memory; the stacked > DRAM could be (part of) main memory itself. Why not? > > > > Which if used right would provide enough bandwidth buffer to > > have the I/Os plus having the option to direct route to/from networkMIC would > > make the 102.4 GB/s CPU memory subsystem reasonable. > > > > The next big problem is > > going to be feeding the network bandwidth. With that type of IO capability you > > would need 9+ 4x FDR IB connections per node. And you're probably going to want > > a switchless topology, can that would be a lot of switches.